Gateway Grassroots (GGI) has just announced another Individual Initiative has rolled out. This third Initiative, less than a week after the organization’s establishment, is a call to all women who have a story to be told about how they got involved in activism and the Tea Party movement. Virginia Kruta is heading up this Initiative. This book will collaborate the stories (30-40 pages long, each) of women and their crusade to fight for our Constitution, our Country, and our future. For submission details, check out the Gateway Grassroots on the web. Gateway Grassroots announces Book Club Giveaway! 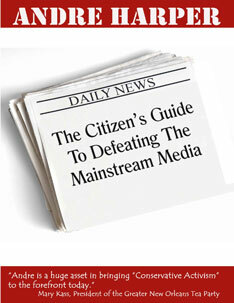 Win your free copy of Andre Harper’s book “The Citizen’s Guide for Defeating the Mainstream Media” beginning today! Visit Gateway Grassroots for more details. Tea Party 2.0: Introducing the Gateway Grassroots Initiative! Over the past two years and ten months, hundreds of thousands of people slowly began to wake up to the world around them. Some were there from day one, others just opened their eyes yesterday. . .and everyone else fell somewhere in between. The Tea Party had been born. Many did not know who or what these people were about in the beginning. The main-stream media had been caught off-guard, so responded the only way they knew how. . .they attacked it. Within a few short months, what were once small gatherings of a few alert patriots, became full family affairs, with flags, signs, chants, and live entertainment for the masses. Groups of thousands, prayed together, fellow-shipped and formed new relationships. These people cleaned up after themselves, and then went home to tell their family and friends about it. They got involved in their communities, became better-read, and talked unashamedly about issues they believed in. The Tea Party has served it’s purpose, in the sense that we “got their attention”. When it comes right down to it, the era of the rally is over. Washington and State Capitols throughout the nation know we are here. It is now time for Tea Party 2.0! We are in the process of moving from attention-getting to the “Now what?” phase of the movement. This is where the Gateway Grassroots Initiative comes in. This organization, the first of it’s kind, is the answer to that question. GGI is dedicated to the education, empowerment and enrichment of patriots in the central Midwest. The organization, is simple and turn-key. . .something any Tea Party organization can model itself after, and that was by design by it’s founders. GGI is about issues and actions, not about a particular candidate or race. We are proud to have the support of so many of the key national leaders and Tea Party organizations in this endeavor. Keep in mind that as we launch, the website will be ever-evolving. We have so many cool things in store, but they need to roll out in natural progression. You comments and suggestions are always welcome and appreciated. We pledge to keep the spirit of the movement alive, and move forward with it’s evolution. Please feel free to check out the site, sign up, and get involved. Challenge yourself to an “Initiative” in the “TIPs” section and join us in the next phase of the Tea Party Movement! Many of you know my story, many more do not. Two and a half years ago, my youngest child entered school, and I was faced with a quandary. . .what do I do? I had been out of the workforce for ten years, my degrees were obsolete, and the economy had already begun to unravel. While I know that doing things on my own (as well intentioned as it may be), I seem to miss the mark. . .so I prayerfully turned to the Lord for guidance. I was shocked when He told me, overwhelmingly resoundingly, that I was to put my efforts into the “Tea Party”. Confused, I obeyed. I had already been listening to Dana Loesch, and many other like-minded personalities on the radio, and following the news 24-7. I attended rallies, but as a quiet observer. I would go, and it felt good. I felt surrounded by people like me. . .I was comfortable in my own skin. I did not for a second feel uncomfortable in my faith, beliefs or disdain for political-correctness when I was there. I was touched by the patriotism, respect and responsible nature of those I was surrounded by. But something was missing. I would Rah-Rah rally in a large group, but then go home and sit, brooding on my couch. . .yelling at my television. I still has no voice. Rewind a bit. a funny thing happened one day. I got a friend request from someone I didn’t really know one day. I had accidentally met him at a rally, but it was really just niceties in passing. To this day, I don’t even know if he remembers that. . .I’ve never thought to ask. It was Chris Loesch, Dana’s husband. In hindsight, I’m thinking, first of all, he sent that because this man is the epitome of the dedicated husband. Every woman should be as blessed! He has his wife’s back 24/7. And I really think he wanted to know who his wife was interacting with, specifically to cover her. But I think there was more to it. Dana and I are very similar, with a deep love for the Lord, our children and family, our country, our freedoms, culture and the arts. . .I could go on and on. We also have the same sense of humor. I think Chris identified with this. Dana inspired me over months, and we started to interact on a more regular basis. I felt empowered that I was not the only enraged mother out there. I also felt that being 7 years her senior, I wasn’t on the ball. If she has spoken out at her age, why the heck had I not yet? She had the courage that I did not at that point. . .and it was all about to change. One night, I was watching my children sleep, and was overcome by rage. . .looking at these beautiful, innocent children, I thought to myself “you have been mortgaged!” I believe that God granted these blessings to me, and I was given the responsibility to raise, love and protect them. I have failed in protecting them by not standing up to the beast destroying our nation, their future, and that was enough for me. After kissing them goodnight, I took to my computer, and just ranted. Little did I know at the time that Chris Loesch is a night-owl, and saw my rantings. I declared myself “all-in”, and apparently, that was enough for him. He held me to it. I was hosed. I couldn’t look back at that point, and I didn’t. I almost immediately became consumed with my local Tea Party, sometimes working up to 60 hours per week come election time. . .and I loved every moment. I started my own local Tea Party group, and we met regularly and rallied in Fenton as well. From there, the rest of the story is a wonderfully bizarre fluke. I never in my life believed that I would be part of something so wonderful, and meet the people along the way that I have. Mostly, I am grateful for the friends I have made along the way. In a day and age of God-less, politically-correct, entitlement-minded, pro-socialism, it is rare to find yourself comfortable in your own skin when you are a Jesus-loving, pro-family, Constitutional Patriot. Over the past few years, I have let some into my life, which is rare for me, as my trust in others has always stood at code red. Others have let me into their lives, and that has been a tremendous blessing. To learn about more of my friends, simply visit my blog roll. In the end, I owe a huge thank you to both Chris and Dana. Chris for calling me out and holding me to my word, and Dana for inspiring me to be the principle-driven wife, mother, patriot and friend that God has called me to be. My they, their family, and their endeavors be truly blessed. I am forever blessed by them and their friendship. There is a terrible travesty against Liberty about to happen in DC. We need you to act today as early as possible. The NDAA (National Defense Authorization Act) is moving fast and it contains a portion that authorizes the Detention of US Citizens on US soil by the US Military, what is worse is that they can be detained in interment camps indefinitely without due process. We have an opportunity to have this Unconstitutional authorization taken out of the NDAA. Please go to this Link and send this simple message to your Congressmen and Senators. It is very simple to do. I also urge all of you to reinforce this action with a call to you Congressmen and both Senators. We must use every tool at our disposal to stop this! Phone numbers for your Congressman and Senator can be found on www.showmepatriots.org under the legislative contacts tab. Thank you for standing once again for liberty!